As-Suffa Outreach invites you to learn how to convey the call and take care of new muslims. An interactive course teaching you how to talk to non Muslims about Islam, convincingly and in a structured way. Learn what to do with all those uncomfortable questions that people always ask and build your confidence. 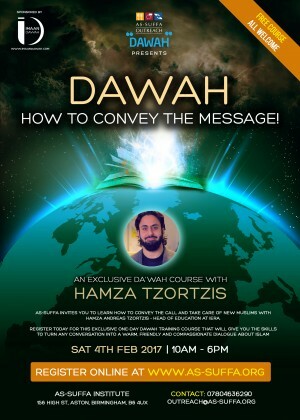 Register today for this exclusive one-day dawah training course that will give you the skills to turn any conversation into a warm, friendly and compassionate dialogue about Islam.